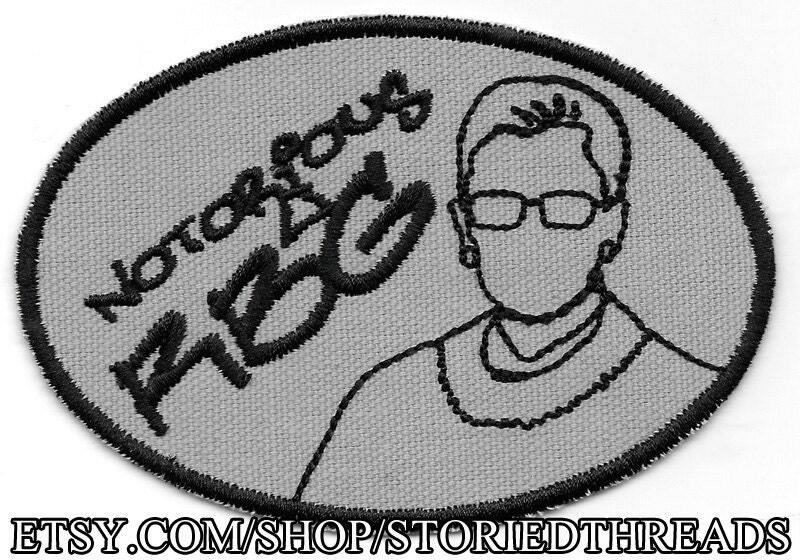 I’ve been wanting to do a Notorious RBG design for a while, and it’s one of those ones that simply took time to come together in my head. The idea of using a graffiti effect, a typically subversive art form, to represent the Justice with the best record of looking out for those of us who most need her protection, seemed too perfect once I thought of it. I hope you like this design as much as I do. The sew-on patch is stitched in black on gray cotton canvas, and measures approximately 4.7" wide by 3.2" tall. Design (C) 2017 Storied Threads/Veronica BaileyStandard shipping for all items is by First Class mail and does not come with tracking information. If you wish to add tracking, please ask (an additional charge may be necessary). Great patch. Perfect gift for a friend recently graduated as a lawyer. These badges deserve FIVE STARS. They're so well made! I purchased these badges as special gifts for people I love dearly. It tickles my nerdy soul that StoriedThreads has created these treasures. The transaction was perfect, shipping was fast, & I will return for more.